This is the first crochet bag I have ever crocheted. 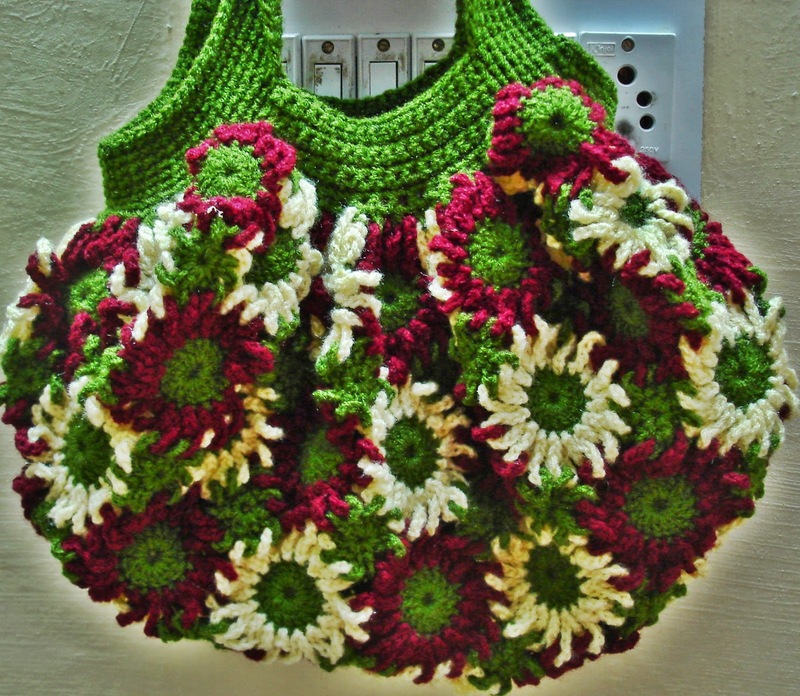 The tutorial pattern of this bag is by Meladora's Creations. There are two separate videos for this tutorial, one is for making the flowers and the other is showing how to connect the flowers and how to do the handles. 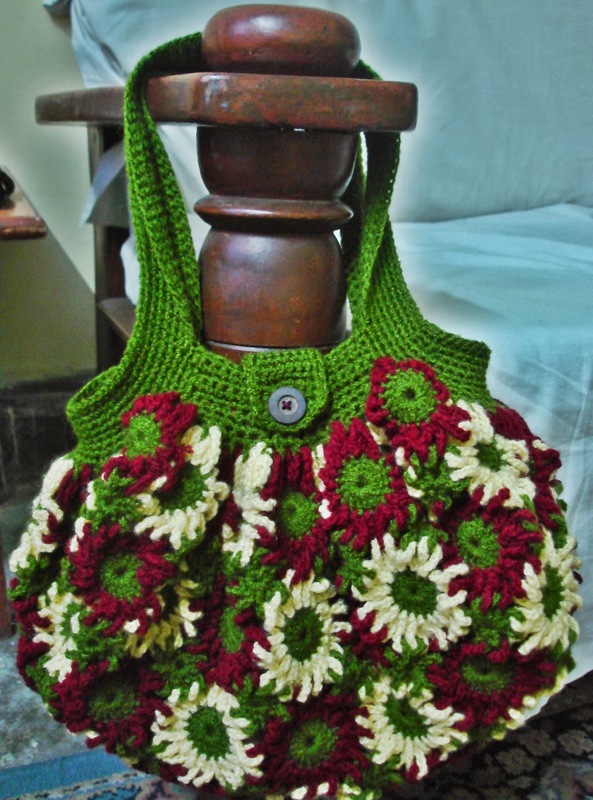 This bag has 63 flowers in all because I made a bigger one. Each flower is about 3 inches. 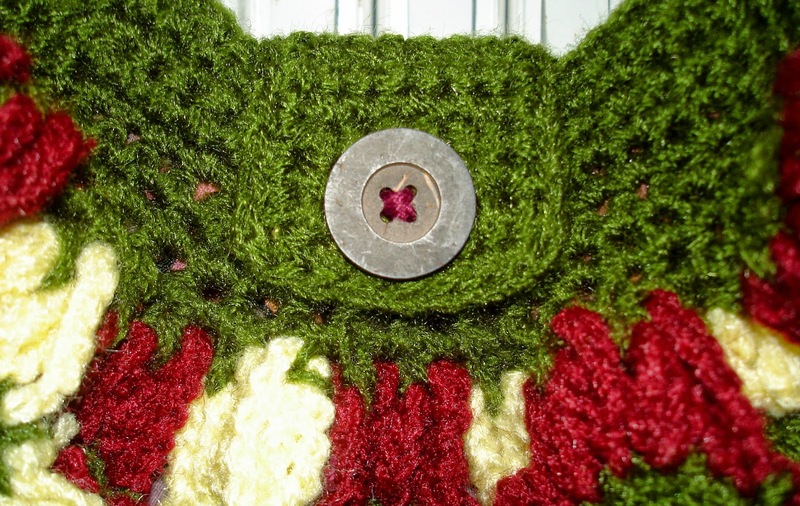 The finished connected flowers will look like a rectangle and so the longer side would be your front and back and the shorter sides would be the sides of the bag. I think if you wish to make a much bigger than this one, you can just add 2 or 3 more flowers horizontally and vertically. What's important though is that when you start single crocheting the first row of the upper part towards the handle, be consistent! I mean, the number of single crochets in one side must be the same for the opposite side. This particular pattern requires an inside lining because it's "hole-ly". Aesthetically, this pattern is very nice but safety wise, not very much, unless the lining is really thick that you will feel comfortable enough to carry your wallet, cellphone, and other important things in it. It also cannot carry heavy loads. The lining I used is my old wrap-around skirt and it's 23 X 29 inches so I have a good amount of space for stitching...I did hand stitch because I don't have a sewing machine with me. Meladora also has a video on how the seamstress did the lining, which I followed. I also stitched a smaller pocket inside with a snap so I can put my phone there itself. It's made from acrylic yarn and I used an over-the counter steel crochet hook number 10, well that's what it says in the hook. I paid Rs. 8 for it. You can try it out yourself!